Intelligent, sprawling saga of a squad of American soldiers, following them through Europe during World War II. 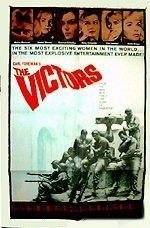 Twentyfourframes: Directed by Carl Forman, “The Victors” is a film that has disappeared off the cinematic map. Unusual film for its time, a serious uncompromising anti-war film that was a big production for Columbia Pictures who had aspirations of Academy Awards for the film. Released during the prestigious Christmas holiday season at almost three hours in length, the film is a grim, epic anti-war drama with an all-star cast. The cast includes Vince Edwards, Melina Mercouri, Albert Finny, George Hamilton, Jeanne Moreau, George Peppard, Maurice Ronet, Romy Schnieder, Elke Sommer, Eli Wallach, Peter Fonda and Senta Berger. With this kind of cast it is strange this film has not seem a home video release. For Carl Forman this was the only film he ever directed. Better known as a writer (and some time Producer) of such films as “The Guns of Navarone”, “High Noon”, “A Hatful of Rain”, “The Bridge on the River Kwai” and “MacKenna’s Gold” among others. Slant: Like many strong American war movies (from The Best Years of Our Lives to The Big Red One to The Thin Red Line), The Victors focuses on a group rather than on one individual, with accompanying commentary on group patterns and behaviors. (The Hurt Locker, by contrast, seems much more focused on individual trauma.) Foreman’s film sets up its social dynamic from its first scene, where a voiceover introduces us to our American soldiers, arriving last at their two German prisoners, “not-so-masterful members of the master race.” We’re told that in war there are two kinds of people, the vanquished and the victors. Nearly every scene in this episodic film illustrates that dynamic, whether the opposed be soldiers in different armies, men and dogs, or concentration camp survivors and their American saviors. Most frequently, though, the vanquished/victor dynamic emerges between American boys and European girls. Married Vince Edwards pines for married Rosanna Schiaffino, George Hamilton chases down young Romy Schneider, George Peppard falls into the older Melina Mercouri’s clutches, strong Eli Wallach protects quivering Jeanne Moreau (think about that last pairing). At times the movie feels less like Battleground and more like La Ronde—though, funnily, with its focus on all the time and space lovers spend without each other, the light love story La Ronde proves the sadder film. I've never even heard of this film! Looking forward to giving it a watch.